So, how exactly does the Neighborhood Association serve NOTA? 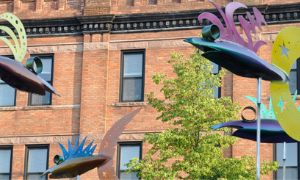 Our committees each play a role in connecting the community, advocating for and updating residents, planning growth, and keeping the neighborhood a great place to live. The Archives committee helps to conserve the organization’s history and preserve records of how it has served the neighborhood over time. Every month, the Communications committee sends out the NOTA-Bull email, full of news, events, updates, and other items of neighborhood interest (subscribe). Committee members also regularly update website content, and administer two Facebook pages: the Association’s public page, and the Neighbor News Group, where all members can create posts (become a member). The community at large should have a say in how NOTA moves forward. Monitoring development helps us to open lines of communication between residents, local government, and property developers so that new investments benefit everyone and continue to enhance NOTA’s strong character. The Engagement committee handles the legwork of knocking on doors, distributing flyers, and posting info to keep the neighborhood informed and active. These volunteers are also instrumental in forging partnerships with the community organizations and block clubs that help turn ideas into actions. Throughout the summer, the Events & Activities committee sponsors monthly Bagel Brunches, popular Saturday socials held at various outdoor gathering sites around NOTA. Featuring fresh bagels, coffee, and juice, Bagel Brunches are the perfect opportunity to catch up with neighbors old and new. What other events do you think would be great for NOTA? Well, get on the committee and make them happen! Care for the corner gardens on University Ave at Merriman St and Portsmouth Terrace rests in the hands of the Gardens committee. This committee’s expert green thumbs also oversee membership in the Community Garden. Participants can grow fresh vegetables in one of a dozen 4′ x 8′ plots located behind the MuCCC Theater. Plots are $25 and are assigned in early spring. Email the NOTA Community Garden to reserve a space. If you feel safe streets and positive police relations are important, the Public Safety committee may be for you. Volunteers take part in important RPD initiatives like the Police Citizen Interaction Committee (PCIC) and the Police and Citizens Together Against Crime (PAC-TAC) program. This committee also engages with the city on ways to improve traffic safety and reduce risks. The Public Works committee is tailor made for dog walkers and anyone else who enjoys strolling or biking around the neighborhood. If you see something that doesn’t quite look as nice as it could (or that got smashed to bits), you can let the right people know and help get it fixed up all pretty. Interested in joining a committee? We welcome new volunteer committee members, and it’s easy to get involved. Just get in touch with us and tell us how you’d like to contribute. Thanks for helping out the neighborhood by taking a leadership role in NOTANA’s future.